The US government will return the first group of migrants seeking asylum in the United States to the Mexican border city of Tijuana on Friday. The US government will return the first group of migrants seeking asylum in the United States to the Mexican border city of Tijuana on Friday, U.S. and Mexican officials said, marking the start of a major policy shift by the Trump administration. The policy dubbed the Migrant Protection Protocols (MPP) and first announced on Dec. 20 will return non-Mexican migrants who cross the U.S. southern border back to wait in Mexico while their asylum requests are processed in U.S. immigration courts. The plan is aimed at curbing the increasing number of families arriving mostly from Central America who say they fear returning to their home countries due to threats of violence. The Trump administration says many of the claims are not valid. The program will apply to arriving migrants who ask for asylum at ports of entry or who are caught crossing illegally and say they are afraid to return home. Children traveling on their own and some migrants from "vulnerable populations" could be excluded on a case-by-case basis, the Department of Homeland Security said in a fact sheet. "The MPP will provide a safer and more orderly process that will discourage individuals from attempting illegal entry and making false claims to stay in the U.S., and allow more resources to be dedicated to individuals who legitimately qualify for asylum," the DHS said. Illegal crossings at the southern border have dropped dramatically since highs reached in previous decades, but in recent years more families and unaccompanied children from El Salvador, Honduras and Guatemala are migrating to the United States and asylum applications have ballooned. Last year, about 93,000 people sought asylum at the southern border, up 67 percent from 2017, according to U.S. government data. Asylum seekers are typically granted the right to stay in the United States while their cases are decided by a US immigration judge, but a backlog of more than 800,000 cases means the process can take years. Now, the US government says migrants will be turned away with a "notice to appear" in immigration court. They will be able to enter the United States for their hearings but will have to live in Mexico in the interim. If they lose their cases, they will be deported to their home countries. Mexico has said it will not accept anybody facing a credible threat in Mexican territory. But immigration advocates fear Mexican territory is not safe for migrants who are regularly kidnapped by criminal gangs and smugglers, and have raised concerns that applicants will not be able to access proper legal counsel to represent them in U.S. courts. 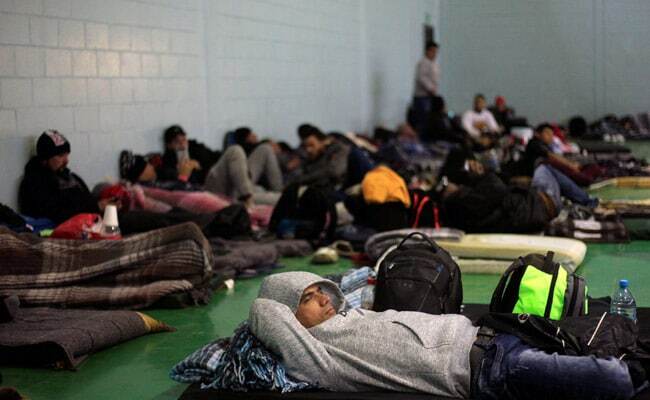 It is unclear how Mexico plans to house what could be thousands of asylum seekers for the lengthy duration of their immigration proceedings. Some Mexican border towns are more violent than the cities the Central Americans left behind. The Trump administration says it is relying on a U.S. law that allows migrants attempting to enter the United States from a contiguous country to be removed to that country. But the policy will likely be challenged in court since claiming asylum is protected under both international and U.S. law. Several of Trump's signature immigration policies, including some attempting to reduce asylum applications, have been halted by US federal courts. Trump argues that the asylum system is abused, calling a process by which many migrants are freed in the United States to await immigration trial "catch and release." Trump is demanding $5.7 billion in funding for a wall along the Mexican border, triggering a U.S. partial government shutdown that stretched to its 34th day on Thursday and has left 800,000 federal workers without pay.